I have heard the tuned intake increases the horsepower by 5 horse on the Rotax 912 uLS. Is that true? Any of you testing running engine with and without? Tuned intake? I did hear a Rotax sticker on your cowl is good for at least 10. Damm joey thats what they told me about the Moon Eyes sticker to but for some reason i couldnt get it to help, But thats hotrod lingo. I don't know if it is actually tuned, but I did hear the same, that the 100 HP rating is with the airbox and it doesn't get full HP without. Looks to me like the reason it would work better than the two air cleaners I and most people have is those short runners between the airbox and the carbs would allow the air to get organized as it enters the carbs instead of coming in at a 90 degree angle to the mouth of the carb and becoming all turbulent as it bends the corner into the carb. Just my guess. 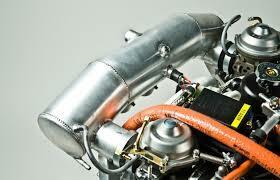 I'm researching this because I will need a modified airbox. Don't know if its worth the time and money. The standard one in the picture wont work for me because of clearances from the firewall. A friend with a 100 HP Rotax on his Kitfox had the "Zipper" kit installed by Hal who is located at Elco Nevada and does these mods. The claim is that the HP is increased to 114 HP. We didn't change the prop pitch after the mod and when he took it up for a test he was getting 2000 FPM and the engine would over rev straight and level. We repitched the prop and now he gets better cruise along with great climb. The Kitfox owner really likes the new performance specs. I installed the Zipper Big Bore kit (114hp) a couple months back. In my model C it feels like it will climb straight up. There is so much cruise power that I cannot firewall it for fear of exceeding 130 mph. No need for the tuned intake. Zipper kits are 4300. I did work myself. Very easy. I did the 105 hp Zipper. Very happy, easy install.